Do you have anything to do on Thursday evening? If you enjoy comedy shows like “Whose Line is it Anyways,” then head to the Little Theatre, in the Student Activity Center and check out your favorite theatre buddies doing improv. The members of improv this year include; Kylee Bird, Gordon Dunn, Bo Thomas Brady, Ryan Jensen, Heidi Scott, Mike Rohde, Spencer Farr, Zach Reynolds and Mike Mutchler. Plot intensive games are unscripted acts. Usually at the beginning is presented a scene and the players run with it. The last category of games is guessing games. In a guessing games, there’s usually one person that leaves the room and while they are out of earshot, something is decided on that they have to guess. When the person comes back into the room there are people who act out what the person is supposed to guess. There are many different games that fit into each of the categories, and most of the games involve the audience in some way. 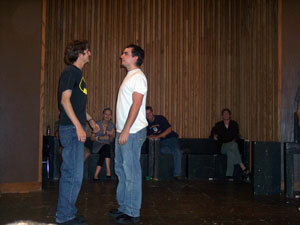 Improv at CEU was started four years ago by Nick Dunn, Jacob Dickey and other theatre majors. Improv was a popular activity while they were here, but after they graduated it died off. When Gordon Dunn, (Nick Dunn’s younger brother) came to CEU last year he was interested in bringing it back because he had heard many stories about how much fun it had been. Dunn mentioned maybe starting to do improv again at an Elmo club meeting and Zach Reynolds, Mike Rohde and Mike Mutchler expressed interest in it also, so they decided to give it a shot. Most members of improv right now are sophomores, and will be leaving us after this year. The last thing they want to see is something as fun as improv die again. To ensure that it doesn’t happen, the theatre majors are putting on workshops to help interested students learn the games so that they can take over when the sophomores leave. The only requirements to be part of the workshops is that you must be part of the Elmo club and you must be willing to have a good time.